WashRa is, simply, a set of Ethiopic fonts and a keyboard layout for use with Windows application. You may use WashRa with wide range of Unicode compatible Windows application including MS Office, Open Office, Adobe Photoshop, Adobe InDesign, Mozila Thunderbird, MS Outlook, and much more. WashRa 4.1 is compatible with Windows 2000, XP, Vista, Windows Server 2003, and Windows Server 2008. The keyboard layout, generated using the MSKLC1 (Miscrosoft Keyboard Layout Creater) tool, works consistently accross Windows application with no problem. It can be switched using short-cut keys or the language bar. The WashRa fonts are released under the SIL Open Font License and for more information please visit http://www.sil.org/ofl. Installation problem on Windows Vista is resolved. No more manual configuration is required to activate the WashRa Keyboard layout. The slant version of Ethiopic WashRa Bold and Ethiopic WashRa SemiBold fonts are removed. WashRa 4.1 is released in two parts--WashRa Keyboard Layout (washra-keyboard-4.1.exe) and WashRa Fonts (washra-fonts-4.1.exe). You must download and install both of them to have a full functional environment. In case, if you are interested just only on the WashRa fonts without a setup program, please download the file in ZIP format. You might be also interested on Sabaean font. 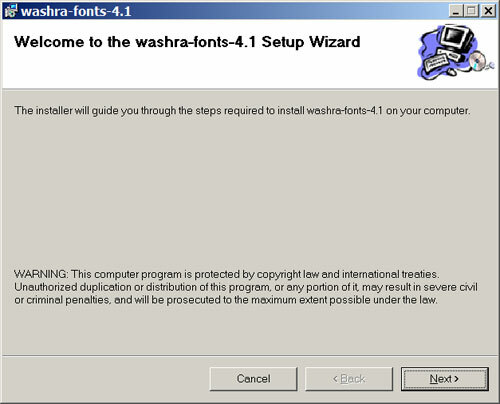 This instruction assumes that you have downloaded the two WashRa files washra-fonts-4.1.exe and washra-keyboard-4.1.exe as outlined above. Which file you install first doesn't matter; however in this process, we will install the WashRa fonts first. Double click the file "washra-fonts-4.1.exe" from the location where you have saved the file, most probabily the Desktop. The setup process starts and display a dialog box similar to the one shown below. and then click the "Unzip" button. Click the Setup button. 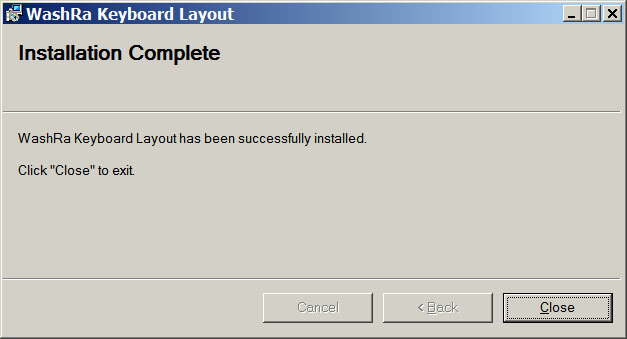 The installation process starts and displays the following Welcome dialog box. From this point on, process the installation by clicking here and on the subsequent dialog boxes the Next button until the installation is completed. From the Desktop, locate the file "washra-keyboard-4.1.exe" and double it. The setup program starts and displays the following dialog box. Click the Setup button. The installation process takes a moment and when it is done the following dialog box is displayed; that is, the installation is successful. One way to check if the setup and configuration is successful is by looking at the list of keyboard layouts in the language bar on the desktop. You should see there WashRa Keyboard Layout. Switching Keyboard: You may switch between different keyboard layouts by just pressing Ctrl+Shift or by clicking the keyboard icon on the language bar and then select the layout you want. The following set of figures show the WashRa layout; how each pair of keys stroke is mapped to Ethiopic character. Entering an Ethiopic character requires pressing a pair of keys and always the basic key must be entered first, then the qualifier key. The result is shown after each pair of key strokes entry is completed. The following figure illustrates this. [Ethiopic punctuation marks] There is one-to-one key mapping to most of punctuation marks. [Ethiopic digits] Two key strokes are ampped to each Ethiopic digits.